KH-F3B series card issuing machine supports IC/RF card R/W and issuing/collecting functions, which is primarily applicable to self-service terminal equipments such as parking lot management system, expressway toll gate, self-service charging system, self-service card vending terminal, bank card management system and electricity bill payment system. --Couple of sensor can detect reclaim card tank is full, card tank empty alarm, card position detect etc, can easy distinguish card position and status. --Industry conceiving, surface dealing with roast paint, well bearable cubing and rotting. Be suitable to all kinds of bad environment, such as high, low, and mush dust, etc. * Supports ISO7816-2. contact type IC card reading/writing..
* Supports ISO14443-A contactless Mifare Type A/B card reading/writing. * Unique dispensing wheel design: is capable of issuing various embossing cards accurately. 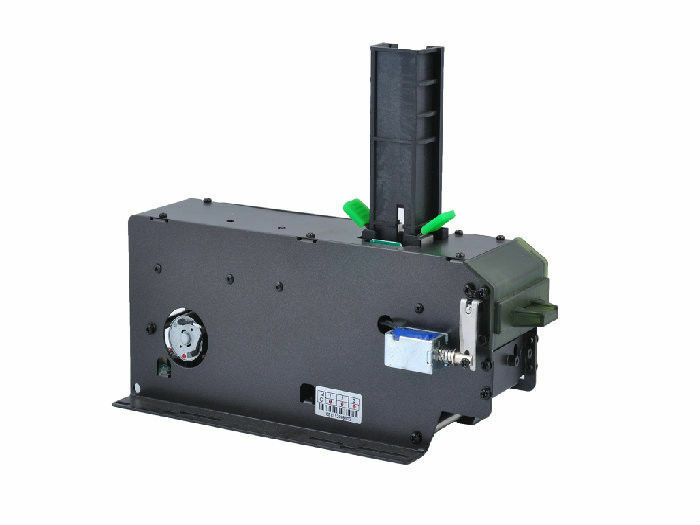 * Automatic internal adjustment: ensures accurate issuing cards of different thicknesses. * Multi functions in one device: provides IC/RF card reading/writing, issuing/collecting functions and effectively saves space for the complete machine. * Rear card capture box: provides convenience for card management. * Simple collection channel design: satisfies user requirement for large collection amount. * Multiple sensors: are able to judge the card position and indicate the card status. * Scientific card transfer wheel design: automatically avoids dust accumulation which will lead to slippage. * High-strength wearable plastic channel: is adopted to reduce the risk of metal shielding and increase the success rate of RF card reading/writing. * Multiple levels of sensor circuit protection: prevents optical interference. * PCSC protocol: is available.